On his blog Current Matters, Mark Orton reports on a presentation made last week at the Hudson Area Library by students in the Hudson Community Schools' Writing Center at Hudson High School. 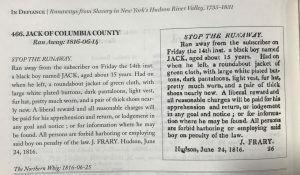 The presentation was titled "Abolition and Women's Rights in Local History," but of particular interest to Orton was the evidence presented of slave ownership in the Hudson Valley in the early 19th century: "Slavery in Hudson and Columbia County, NY." 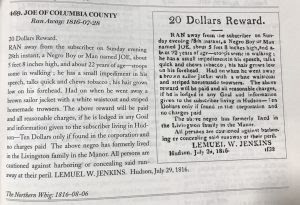 Below are two notices of runaway slaves reproduced in Orton's blog post, both of which appeared in 1816 in a Hudson newspaper called The Northern Whig. Excellent peak at just how widespread chattel slavery was in the Hudson Valley. Thanks for the additional reference, David! The recently published book Mark Orton refers to is quite chilling when read aloud with locations like Claverack mentioned.